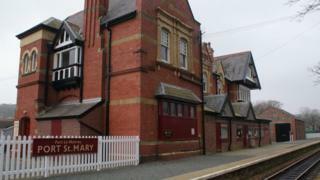 A Victorian railway station built during the Isle of Man's tourism heyday has been added to a list of the island's registered buildings. The two-storey red brick Port St Mary station was built in 1892 to replace a previous wooden structure on the Port Erin to Douglas line. A government spokesman said the building is of "special architectural and historic interest." Port St Mary Commissioners welcomed the news and said it was "long over due". Chairwoman Michelle Haywood described the building as "iconic". Manx National Heritage director Edmund Southworth said Manx railways were "a unique survival of international importance". Registered status prevents any demolition, alteration or extension of the building which would affect its character. Mr Southworth said "sympathetic" changes could be made, however. He said: "MNH is keen to see that structures such as these have a sustainable use and we welcome high quality and sympathetic changes which give historic buildings long term care. "We also note that the challenge of running modern services safely and effectively in historic structures places particular pressure on operators." The original station was built 18 years after the Port Erin to Douglas steam railway opened, in 1874. Uniquely for the time, it provided accommodation for the station master and his family on the top floor.